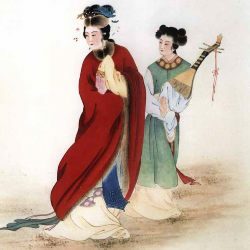 Princess Zhao Jun Goes Beyond the Frontier (Pipa, Zhao Jun Chu Sai, 昭君出塞, 琵琶曲) is one of the representative works of ancient Chinese Pipa music. The story happened in Western Han Dynasty 206 BC.-AD 24 (西汉). Princess Wang Zhao Jun got married to a prince of Xiongnu (匈奴) so that peace could be kept between the two countries. Play Princess Zhao Jun Goes Beyond the Frontier (Pipa, Zhao Jun Chu Sai, 昭君出塞, 琵琶曲) with HTML 5 Player, no flash required, no software required.